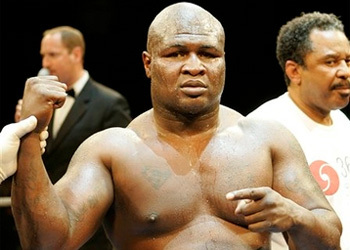 While appearing as a guest on ESPN2’s MMA Live prior to Saturday night’s UFC 113 event, president Dana White said that former boxer James Toney would likely make his MMA debut against Randy Couture. “I’m gonna do it, it’s looking very much like Randy Couture versus James Toney. And for all of the positive and negative things people are going to say about this fight, I think a lot of people are going to wanna see it,” White stated. After Toney officially signed with the UFC earlier this year, it was Couture who immediately volunteered to welcome “Lights Out” into the Octagon. Couture believed the legend vs. legend/striker vs. grappler matchup would be the most intriguing for fans, and it appears as though White agrees. “I’m the first guy to go out and start blasting people for making freakshow fights and I’m ready to take my lumps on this one,” White told the MMA Live crew. Although the bout was all but announced on Saturday night prior to UFC 113, White refused to spill the beans about where and when the scrap would actually take place. When ESPN’s Jon Anik asked White if the bout would go down at UFC 118 in Boston on August 28th, White remained tight-lipped. “Perhaps,” White said with a smirk on his face.